Intergalactic 2018. Paint and spore on panel, 52 x 52 inches. If Only Words Had Shadows, 2018. Mixed media and paper wasp nests. 168 x 90 x 126 inches. The Tangible Evidence of Hope 2018. Spore on panel, 52 x 52 inches. If Only Words Had Shadows, 2018. Mixed media and paper wasp nests. 168 x 90 x 126 inches. Such Delicious Pies 1999. Guache on bracket mushroom. 10 x 6 1/2 x 6 inches. In this selection of drawings made over the past thirty years, we see evidence of Toia’s desire to use any material available to explore the mark-making process. Numerous drawings in the exhibition come from ledger pages. While dumpster diving in a courtyard of a former Franciscan monastery that had been turned into an infirmary, Toia discovered a bounty of ledger books early in his career. The infirmary was being upgraded, and materials and records were being thrown away. Toia saw the ledger pages, full of relentless record keeping, as a foundation and underlying structure to overlay something new. This discovery forged a whole new path of exploration for decades of artwork, layered over and around each page of the ledger. Toia extracts from the natural world; mud, pine needles, sheep’s wool, walnut ink, materials found in the proximity of his travels that become vehicles for new consideration. Nature and other materials, such as rubber and plastic, prompted the artist to delve into the unknown and to rely on chance to help determine form. The desire to relinquish control is something Toia has leaned towards all his life. He seeks materials that process their own force and make their own declarations. He lets chance mitigate outcome by leaving a great deal up to fate and circumstance. Such desire to employ different tendencies of nature is an attempt to connect with the physical laws of the universe. These intimate processes of the natural world often elude mankind as we progressively pull away from nature, isolating ourselves. 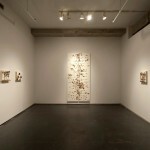 The three new works on view support this approach in the art making process, but in divergent ways. 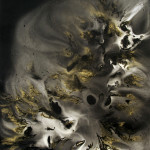 The large spore drawings are a direct collaboration with nature. “If Only Words Had Shadows” finds the artist using a natural process, but introduces the hand to collaborate more deliberately. 1996 “Sculptor Who Collaborates with Nature” New York Times, Vivian Raynor, September 1. 1996 “Sculptor’s Creations are Second Nature” The Star Ledger, Eileen Watkins, August 21.